The humble lunch box, which really only emerged as a popular item in the 20th century, provides us with a pictorial history of pop culture. 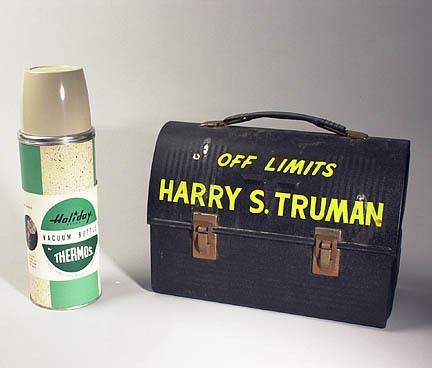 Lunch boxes were among the first functional items to be employed as 'marketing merchandise'. Each decade reflected its own particular lunchbox art and if something appeared on a lunch box -be it a character, toy, pop star or TV show, then it must have been reasonably significant within its own cultural context. 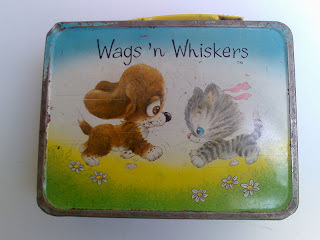 Although lunch boxes themselves had been around for a while, pictures on lunch boxes became particularly popular in the 1950s when lithographed images on metal (which had been used since the late1800s for the production of tin toys) combined with the emerging 'youth market' of the 1950s and 60s and the aggressive marketing campaigns that accompanied it. 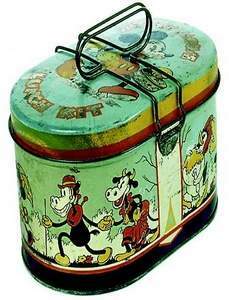 One of the very earliest licensed character pictorial metal lunch boxes was made in 1935 and depicted Mickey Mouse and friends on an oval tin with a pull out inside tray and a thin wire handle - designed by Geuder, Paeschke & Frey. As a collectible, the tin is now worth thousands. Since then of course, countless Disney characters have made their way onto children's lunchboxes. 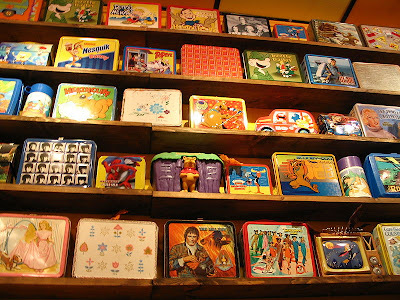 From the 50s onwards, lunch boxes designed for school children were produced en masse, with anything from Nesquick and Hopalong Cassidy to Barbie or the Beatles imprinted on the top and they served the dual purpose of functionality and marketing. In more recent times, rust-free molded plastic and vinyl replaced metal as the lunch box of choice for manufacturers, though in 2002 consumer confidence was shaken somewhat by revelations that some vinyl lunchboxes contained hazardous amounts of lead, compelling the industry to test lead levels before sale.